During the warmest March ever recorded in Michigan’ s Upper Peninsula, the snow melted unusually early. We used this opportunity to clean up several years worth of construction debris in preparation for the upcoming building season. Contractor bags and scrap lumber awaiting a trip to the transfer station are not very photogenic, so I will spare you the gory details. 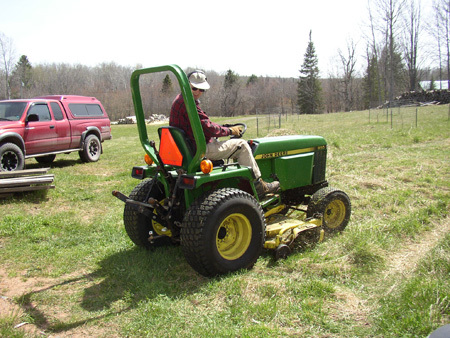 For quite some time we have been scouring Craigslist and the local classifieds for a used tractor to help us keep up with all the chores and maintenance around the property, but nothing suitable ever came up. As luck would have it, one of my co-workers decided this spring to part with his compact tractor which was a bit over sized for his place in town, but is perfect for us novice tractor owners with acreage to tame. 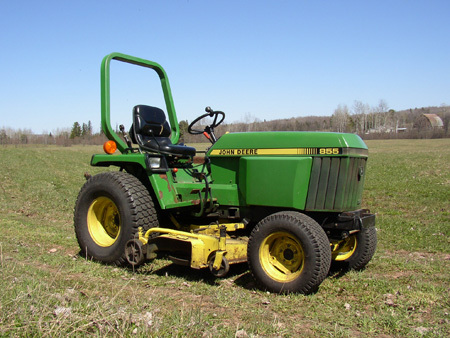 The 1988 John Deere 855 came with a snow blower and a 60″ mowing deck. It can reach a blazing top speed of 11 mph. It’s not difficult to drive and handles surprisingly well. In fact, it’s a lot of fun! We should have a much easier time with many of our construction tasks now that we will not have to struggle with tall grasses and weeds all around the house.